Avie introduces the brilliant young guitarist Mattias Jacobsson who on his debut album invokes a guitar tradition originating with the influential Spanish composer Francisco Tárrega. The repertoire explores Tárrega’s influences and legacy, from the inspiration that Chopin had on his musical output through to his students Miguel Llobet and Emilio Pujol. Tárrega often turned to Chopin’s favored forms – Preludes, Mazurkas and Nocturnes – and also transcribed works in those forms by Chopin. 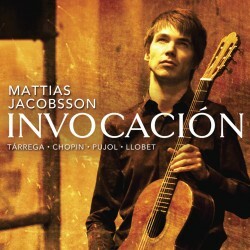 Mattias has created a unique concept in the guitar discography by juxtaposing Chopin transcriptions with Tárrega’s most Chopinesque works. The “invocación” continues through works of two of Tárrega’s most prominent pupils in Barcelona and even extends to Mattias himself, whose first teacher Erik Möllerström studied in Barcelona and secured an instrument from the great guitar maker Ignacio Fleta e hijos, that now has been passed on to Mattias and is played on this recording.